This post illustrates the histogram-based function approximation for very large data sets using Apache Spark and Scala. The previous post introduces and describes a model to approximate or fit a function to a given data set, using an histogram implemented in Scala. (see Histogram-based approximation using Scala). This post re-implements the dynamic resizable histogram using Apache Spark with limited changes in the original code base. Instantiation of an histogram using an estimate of the _x value of the first bin, the width of the bins, step and the initial number of bins, initNumBins. This constructor is invoked for the first batch of data . Instantiation of an histogram using an initial given step and an existing array of bins/buckets of width step. This constructor is invoked for subsequent batch of data (line 8-12). Instantiation of an histogram using its parameters params (line 15). The parameters for the histogram are encapsulated in the following HistogramParams class described in a previous post. For testing purpose, we need to generate a data set of very large (or even infinite) size. For this purpose we load an existing data set from a file which is duplicated then modified with a random uniform noise to create a large number of batch to be recursively processed by Spark data nodes. The amplitude of the randomization (synthetic noise) is significant enough to generate different data point while preserving the original data pattern so the algorithm can be easily validated. private final val DELIM = " "
The data is generated for a specific number of tasks nTasks and loading the data from a local file sourceName (line 1). The generation of the histogram is implemented by the method apply. Once loaded from file (line 12), the input is generated locally as an array of (Float, Float) (line 12 -13). Next, the algorithm adds randomization addNoise (line 15, 16) before converting into a RDD (line 21). The first step is to create a Spark configuration and context for a given number of concurrent tasks. The main goal of the Spark driver is to apply a tail recursive function across all the batches of data. The histogram is computed/updated on the Spark data node, then reduced to a single histogram which is then broadcasted to all the nodes to be updated with the next batch of data. The RDDs are generated by an instance of the DataGenerator class as input (line 1). 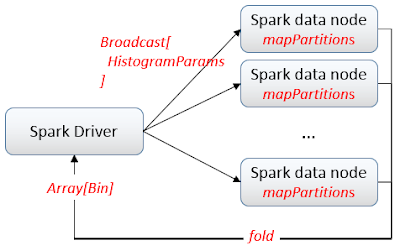 The input is loaded recursively into multiple partitions using the Spark method mapPartitionsWithIndex (line 11). Each partition generates a new array of bins (line30) once the class Histogram is instantiated (line 17) then trained (line 24). The data is then grouped by partition index (line 28). finally the fold method is invoked to generate the array of bins (line 30). The invocation of the recursive method execute on the Apache Spark driver (line 4) broadcasts the current (recently updated) parameters of the histogram initParms_brdcast as one of the arguments of the recursive call (line 5). Upon receiving the broadcast values, the partitions load the next batch of data, generates and processes the RDD input.apply(sc) and update the histogram parameters (line 11). Let's write a test driver to generate the Histogram using Spark RDD. After their initialization (line 1-4), the parameters of the histogram are simply broadcasted to the remote data/worker nodes (lin7,8). Statistics methods - Chapter 2, Descriptive statistics - Pfaffenberger, Patternson - Irwin publications 1981.